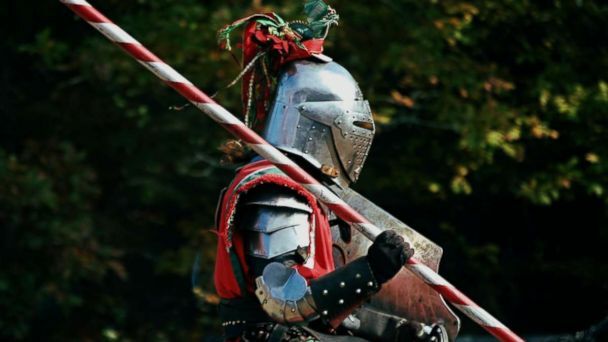 A Virginia man on horseback playing a Medieval knight in a reenactment performance in Kentucky died after he apparently dropped his lance and then became impaled upon it, according to his brother. Peter Barclay, 52, a retired Army lieutenant colonel, had been performing medieval horseback for 30 years all over the world, his brother, John Barclay, told ABC News. Barclay was a veteran member of the Society for Creative Anachronism (SCA), a group that researches and re-enacts the "arts and skills" of pre-17th century Medieval Europe, according to the group's website. Barclay told ABC News that the accident that took his younger brother's life unfolded when his brother's metal-tipped lance -- which he said was used for catching rings, not jousting -- hit the ground and flipped, impaling him under his sternum. The late Barclay, who performed under the name "Master Terafan Greydragon," was something of a Renaissance man himself, his brother said. "He was a master at everything he did," Barclay said. "He was excellent in everything he touched. He was a rock star -- whether it's jousting, or craft-brewing beer or serving our country in the Army." In a Facebook post, Barclay remembered his little brother, writing "RIP Peter aka: Terafan Greydragon!" SCA president John Fulton did not immediately respond to a request for comment from ABC News, but he told The Washington Post, "Something happened with that spear, and he lost control of it or it turned, hit the ground, and as his horse was moving, the tip of it went into him." "He got off the horse, took some steps and people noticed he was bleeding," Fulton told the newspaper. On his Facebook page, Barclay said his late brother was airlifted to a nearby medical center but died en route. The Hamilton County coroner's chief administrator, Andrea Hatten, said that the cause and manner of death remain pending. Barclay left behind a wife and two daughters, according to his brother.